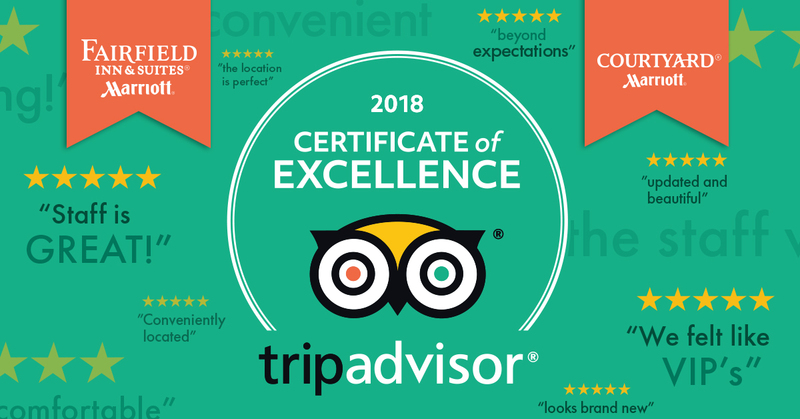 The Courtyard by Marriott and Fairfield by Marriott Inn & Suites of Wausau, both Ghidorzi Hotel Group properties, received the 2018 TripAdvisor® Certificate of Excellence Award given only to establishments that consistently achieve great traveler reviews. Both hotels have an overall rating of 4.5 out of 5 stars. “TripAdvisor gives guests a powerful voice, and we listen intently in an effort to improve how we can make a difference in the lives of travelers and also celebrate the exceptional guest experience our team delivers,” said Chris Ghidorzi, head of Ghidorzi Hotel Group. Ghidorzi is a fully integrated design build construction, real estate development, architecture and interior design firm with projects in Wausau, Madison and throughout Wisconsin. The Ghidorzi design build construction approach gives owners a single source of accountability for bringing their project vision to life. The Ghidorzi Hotel Group proudly serves the business, corporate and leisure travel needs of greater Wausau with a team of exceptional hospitality professionals across five best in class properties, including the Courtyard by Marriott® of Wausau, Fairfield Inn & Suites by Marriott® of Wausau, Hilton Garden Inn Wausau, Westwood Conference Center and Executive Apartments at Corporate Cove.